The root cause for such an inhuman act is a fundamental lack of wisdom and understanding of the human condition. All human beings are companions in birth, in old age, in sickness and in death. Buddhists may train themselves to cope with that type of situation through stillness, wisdom and reflection. Buddhism considers the quest for a direct experiential understanding of the human condition as the heart of spiritual life. It employs a vast array of skillful means and ways of reflecting on life, which people of other religious traditions or indeed people of no religious tradition, might benefit. The more profound our understanding of our existence as human beings is, the more we are protected from blind identification with narrow categories, whether they be social, ethnic or religious. We all as human beings have the capacity to reflect on experience, to learn from it. Whatever religion we profess, we can for instance, look at the effect on our mind of the strong attachment to ideas of us and them. Theists, atheists, polytheists are equally capable of observing how the idea of us and them affects how and what information we absorb from our surroundings, how we interpret that information, and how we express ourselves in our actions and words. We can begin to notice our tendency to believe in the labels we attach to things, and what strong negative emotions are conditioned by those beliefs. As Buddhists, we devote ourselves to learning how to maintain clarity of mind, fundamental compassion and intelligence, as a constant inner refuge. It is not so difficult to be clear about issues which don’t personally affect us, or those which provoke no strong feelings. The real challenge is to be awake even in the midst of a hurricane of emotions — when we are hurt and betrayed, angry and afraid. Clarity of mind means that when things get rough we can still receive the blessings of the principles we uphold. Inner clarity is thus the ground in which the dignity and meaning of life can grow. An inner refuge does not come easily. It can only be brought about by a thoroughgoing commitment to this life education, a training of the way we live internally and externally. Buddhist teachings are seen then, in summary, not as dogmas to be believed in (or rejected), but tools to be made use of. We use the teachings to understand ourselves and our experiences in life, to understand other people and the world we live in. Then basing ourselves on that understanding, we seek to create as much authentic happiness and benefit for ourselves and others as we can. It is very easy to brand people who do terrible things as being evil, and perhaps almost as easy to assume that because we find evil acts repugnant, that therefore we are good. But when we look more closely, we see that our bogeymen, the so-called “evil people” sometimes act well and “good people” may, on occasion, act cruelly. There is no fixed entity, “the evil person”, who is evil 24 hours a day, 365 days of the year. Similarly, (apart from fully enlightened beings), there is no unchangeably good person. That being the case, the most constructive response to the suffering that human beings inflict on each other is surely to seek to understand and affect the factors conditioning the arising and cessation of good and evil in the human mind. 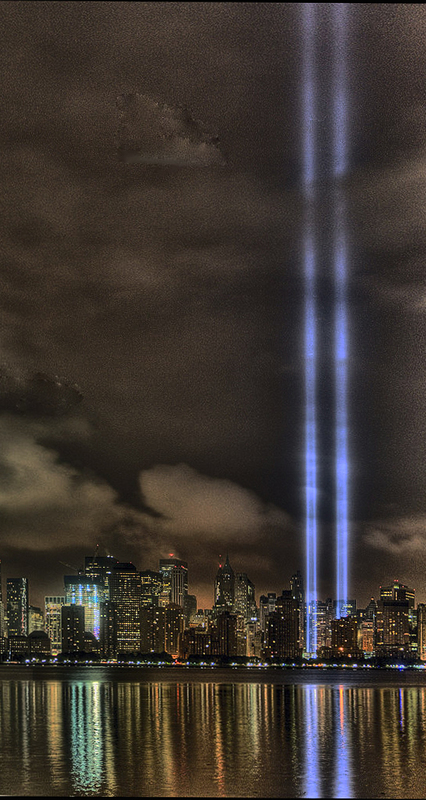 It is turned on every year as a memorial for 9/11 . The cost for the electricity is astronomical so it can’t be lit all the time. I can’t remember how many miles the light beams can be seen but it is miles and miles!